Have you ever seen some beautiful HUD and thought "I wish I knew how to script well enough to make something like that"? Well, now you don't need to. This is a framework allowing non-scripters to create stunning heads-up-displays using a simple (sort-of), html-based language. The HUD that you create can have custom pictures, icons, and gradient bars, as well as formatted text. You can align text, make it bold or italic, change its color, font, or size. The possibilities are endless (not quite) with the new Design a HUD framework. 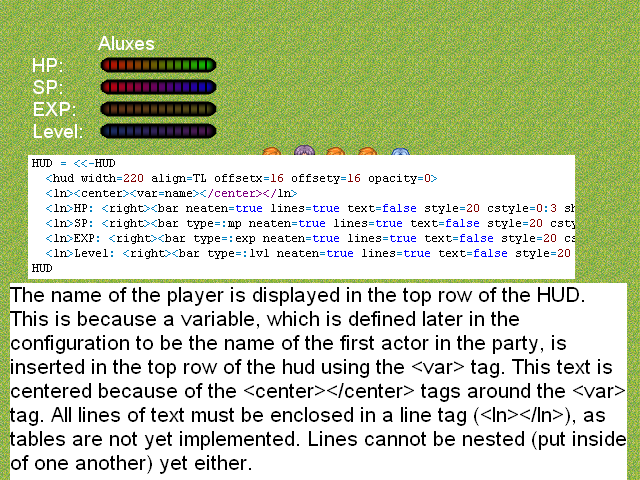 Create amazing HUDs easily with no scripting knowledge. Display the values of variables in the HUD. Display gradient bars for actors in the HUD. Absolutely position elements or align them to different sides of the HUD. unless child.attrs[:abs] > 0 or !aligned.nil? tmp2 = i + 2 + el_name.length unless i.nil? @attrs[:lines] = false if @attrs[:lines].nil? @attrs[:neaten] = true if @attrs[:neaten].nil? @attrs[:text] = true if @attrs[:text].nil? Just set up the HUD text and start creating amazing HUDs. And read about the different elements in the script. Looks like you need to redo the post.